Conops quadrifasciatus is a fly in the family Conopidae; known as the Thick-headed Flies. As the name suggests, heads of these flies are typically the widest part of the insect and this can be seen clearly in the photograph. Many species have wasp-like colouration and they can be seen regularly feeding (and mating) on flowers. Although the adult flies enjoy nectar, the larvae are parasitioids (they parasitise and eventually kill their hosts) of various bees and wasps. 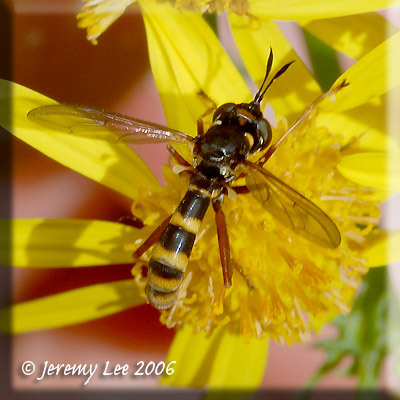 The females of Conops quadrifasciatus specialise in attacking bumblebees in flight. They wait on flowers for a bumblebee to arrive and then hijack the bee and whilst holding on inject an egg into the bee's abdomen. The egg hatches inside the bee and the larva feeds on the bee's abdominal contents. The bumblebee eventually dies and the larva then pupates and emerges the following summer.